Yesterday the national paper had a sort of a local story on the front page. According to the report, the bones buried in Drumcliff Churchyard, in my home county of Sligo, are not WB Yeats' after all or (reading deeper) they may not be. Shock, horror. All those busloads of tourists who come to visit. Even Charles and Camilla dropped by just a few months ago. What will they do now? Who is down there? Where is Yeats? What can it all mean? This is not a new story. In fact, it is as old as the re-interment itself. There has always been the niggling possibility that the bones brought back from France were not entirely those of the great poet. What follows is my own potted history, which is probably wrong on a number of counts. Don't come complaining to me. If you want the exact facts, go and look them up somewhere reputable. I just tell stories here. Yeats died at the Hôtel Idéal Séjour, in Menton, France, on 28 January 1939. He had asked his wife George Hyde Lee to bury him there, in adjoining Roquebrune-Cap-Martin, discreetly. The words associated with this request are, “'If I die, bury me up there and then in a year's time, when the newspapers have forgotten me, dig me up and plant me in Sligo". If it were me, I think I would have chosen that, ‘Dig Me Up and Plant Me in Sligo,’ as my epitaph but more on that in a moment. Yeats died and was duly planted in France, the plan being to bring him back to Sligo in a year. But that was not to be. War broke out and no body was going nowhere for a while, if you’ll excuse the pun. Yeats' bones were dug up and placed in an ossuary which, by definition, is a place or container with lots of people’s bones in it. When it came time, after the War, to relocate poor WB to his desired resting place in County Sligo, the bones were rather a jumble. In a twist which I rather like, and I think he might have too, a sort of 'WB Yeats jigsaw' seems to have been assembled to create a body to bring to Sligo and 'plant' there in ‘Bare Ben Belben’s Shadow’. It's rather a good story with some nice ghastly elements to it. Nobody quite knows who or how many are represented in the grave in Drumcliff. For those who might worry about it, I think there is comfort in the fact the Yeats was supposed to have had an unusually large head and so it seems likely that the skull at least was correctly identified. That’s good. After all, the poetry wasn’t written from his thighbone or his finger. If you’re going to get only one part right, let it be the skull. I’m from Sligo. I could recite that epitaph from when I was knee high to a grasshopper and, later, I learned that it was also the last line of one of WB’s last poems, in which he writes a wonderful instruction manual for where he should be buried and where he will be found. This is why Yeats always belonged in Drumcliff. His instructions could not have been more emphatic. But here’s a confession. It's a bit embarrassing really. Until yesterday, when the whole ‘Bones’ thing was woken up again, I really did not know what those last three lines meant. The epitaph was a mystery to me. Like so much poetry, it was just another intellectual in-joke to which I was not a party. Then, yesterday, I finally did. There’s another line, you see. Yeats cut it out. It didn’t work in the context of the poem, I can almost see that. But, here’s an arrogant suggestion; I think it was a mistake to cut it from the gravestone too. If it had been left, then that 'cryptic-crossword' headstone would have been made into a purer, simpler, more reflective, traditional and shiver-inducing thing than it is. See? See? It’s a simple thing. It's really just one of those ‘Stop Traveller’ exhortations like the Romans used to do on their graves. There is a long tradition of gravestones inviting people to stop and rest and reflect for a while. Even my own parents’ grave tries to hold you up, rather solemnly requesting that you should ‘kneel and pray’. Yeats doesn’t want the passer-by to pray though, he just wants him (or her) to stop, think a while about matters of life and death and then… be on their way. Cool, traditional, deceptively simple. I think this is how the headstone should be. It even rhymes. But, hey, what do I know? And if you ever should happen to stop there, will it be the bones of WB Yeats you will be standing over or some anonymous honorable French gentleman, now many leagues from his home? It doesn’t matter any more whose damp bones lie beneath the limestone slab in Drumcliff. It never really did. 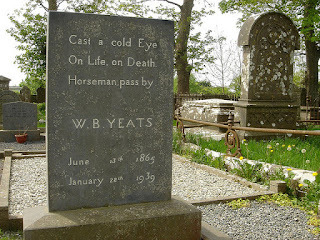 Anybody who wants WB Yeats to be in Drumcliff - family, poetry people, locals - they can have him there. Because his spirit is there. That's why. Because, let’s face it, ‘spirit’ is not a thing. It is a perception. People who think they see ghosts really do see ghosts. Because ghosts are not things. They are things we think we see. It’s just the spirit. It’s where the spirit lies. ... under Bare Ben Bulben. CRUSHER: Is there any special arrangement you would like for the body? KORRIS: It is only an empty shell now. Please treat it as such. That’s how I feel. I don’t get all the reverence that goes with death acting as if the body can be injured—“Treat him gently, lads”—or can feel the cold. It’s an empty shell. Everything that was that person has gone bar our memories of them and I don’t need to go to a graveyard or cemetery to visit a dead loved one. It’s something to do when there’s nothing to do which is the case with so many ceremonies. There’s no meaning in bones. It is entirely possible that none of the bones in Drumcliff held up W.B. Yeats. Who would ever know? I can see visiting a place where a writer lived and worked. When I was in Dublin I went to Trinity College and wondered if Beckett had sat or stood where I had and then I just felt plain stupid and actually a little embarrassed. There was nothing of him there and even when he was there there was precious little of him there. What was I expecting? An epiphany? I think ghosts are a great literary device. In three of my books the protagonist is dead and a couple of the short stories too. But that’s all. The spirit of Yeats lives on in his writing and nowhere else. I do like the poem though. Might see if I can squeeze a bit of it into my new book. Or at least two villages.